Please note that providers of health services, in particular those providing midwifery services, may have their own detailed agency specific guidance which should be read in conjunction with this guidance. This will be found in the local guidance section. Please check your local information section for the agreed timescales for your SCB area. In May 2017, information was added in to Section 7, Child Protection Concerns on the timing of the Initial Child protection Conference. This section should be re-read. Young babies are particularly vulnerable to abuse, and work carried out in the antenatal period can help minimise any potential harm if there is early assessment, intervention and support. This procedure sets out how to respond to concerns for unborn babies, with an emphasis on clear and regular communication between professionals working with the mother and her family. The aim of this procedure is to enable practitioners to work together with families to safeguard unborn babies where vulnerability and risk indicators are identified. It provides an agreed process between Health agencies, Children's Social Care and other agencies working with the mother and her family on the planning, assessment and actions required to safeguard the unborn baby. The National Service Framework for Children, Young People and Maternity Services (2004) recommends that Maternity Services and Children's Social Care have in place joint working arrangements to respond to concerns about the welfare of an unborn baby and his/her future, due to the impact of the parents' needs and circumstances. Although Maternity Services have specific responsibilities, all professionals have a role in identifying and assessing families in need of additional support or where there are safeguarding concerns. Where professionals become aware a woman is pregnant, at whatever stage of the pregnancy, and they have concerns for the mother or unborn baby's welfare, or that of siblings, they must not assume that Midwifery or other Health services are aware of the pregnancy or the concerns held. Each professional should follow their agency's child protection procedures and discuss concerns with their safeguarding lead/named professional for safeguarding. In the absence of a safeguarding lead/named professional for safeguarding a referral should be made directly to Children's Social Care. Avoid delay for the child where the Public Law Outline threshold is reached. When risks have been identified, it is important that practitioners work together to provide appropriate interventions and planning at the earliest opportunity to optimise the outcomes and support for the child and their family. It is essential in safeguarding children that practitioners share information and they should refer to the cross-government guidance on how to share information: Information sharing advice for safeguarding practitioners or the SWCPP guidance (see Information Sharing Procedure) based on this and discuss concerns in the first instance with their safeguarding lead/named professional for safeguarding. The procedures applies to all professionals who have identified any concerns for the unborn baby and provides a robust framework for responding to safeguarding concerns and safe planning by practitioners working together, with families, to safeguard the baby before, during and following birth. In the vast majority of situations during a pregnancy, there will be no safeguarding concerns. However, in some cases it will be clear that a co-ordinated response is required by agencies to ensure that the appropriate support is in place during the pregnancy to best support and protect the baby before and following birth. It may also be necessary to consider the need for particular arrangements to be in place during and immediately following the baby's birth in order to do so. Where there is a late booking or a concealed pregnancy the health practitioner should complete an immediate assessment in order to identify which agencies need to be involved and make appropriate referrals. Health Staff should speak to their Designated Lead to determine if a Maternity Alert may be required. In the case of a concealed pregnancy a referral must be made to Children's Social Care. Any other circumstances or issues that give rise to concern. There are many professionals who may have the first contact or be aware that a woman or the partner of a man with whom they are working, is pregnant or about to become a principal carer. These may be workers in Learning Disability services, Mental Health services, Sexual Health Services, Women's Aid, Drug and Alcohol Services, Police, Probation, Leaving Care Teams, Housing and Adult Safeguarding, GP or Family Nurse Partnership (FNP). 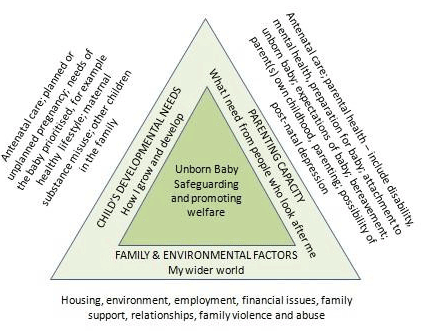 When any professional becomes aware of pregnancy or impending parenthood and is of the view that there will be a need for additional support or that the unborn child will be vulnerable due to the circumstances of their service user they must inform maternity services of their involvement and highlight any vulnerabilities identified. The Early Help Assessment is a holistic assessment that considers the child's developmental needs, parenting capacity and environmental needs to identify and co- ordinate multi-agency service provision and interventions to best support the child and carers. An Early Help Assessment is undertaken in relation to the unborn child. If the parent was under 18 at the point of conception, the young mother must be also be offered an Early Help Assessment by her Midwife. The Early Help Assessment provides an opportunity for multi-agency early intervention to support the mother. Where a professional is concerned that unborn child or other children in the family may be at risk of, or suffering harm they should seek advice from their manager and/or their named practitioner/lead for safeguarding without delay and together consider whether to consult with or refer to Children's Social Care. In the absence of a safeguarding lead the professional may consult with or refer directly to Children's Social Care. In the early stages of the pregnancy, the Midwife must assess the strengths, risks and needs of the family and where there are concerns for the welfare of the unborn baby consider completing an Early Help Assessment in relation to the unborn child to ensure that services and TAC (Team Around the Child meetings) are in place or where safeguarding concerns exist a referral to Children's Social Care is made. It is important for practitioners to remember that an Early Help Assessment or alternative assessment is not required where it has been identified that the unborn baby has already met the threshold of being at significant risk of harm. However all agencies are expected to contribute to a safeguarding risk assessment where undertaken. The circumstances of the mother and other relevant adults must be reviewed regularly to allow for ongoing assessment of need and risk and consider any further action required. These are examples and not an exhaustive list. “The involvement of prospective and new fathers in a child's life is extremely important for maximising the life-long wellbeing and outcomes of the child regardless of whether the father is resident or not. Pregnancy and birth are the first major opportunities to engage fathers in appropriate care and upbringing of children.” (NSF, 2004). It is important that all agencies involved in pre and post birth assessment and support, fully consider the significant role of fathers and wider family members in the care of the baby even if the parents are not living together and where possible involve them in the assessment. This should include the father's attitude towards the pregnancy, the mother and new born child and his thoughts, feelings and expectations about becoming a parent. Information should also be gathered about fathers and partners who are not the biological father at the earliest opportunity to ensure any risk factors can be identified. A failure to do so may mean that practitioners are not able to accurately assess what mothers and other family members might be saying about the father's role, the contribution which they may make to the care of the baby and support of the mother, or the risks which they might present to them. Background Police and other checks should be made at an early stage on relevant cases to ascertain any potential risk factors. Involving fathers in a positive way is important in ensuring a comprehensive assessment can be carried out and any possible risks fully considered. Referrals to Children's Social Care about unborn babies should be made early in the pregnancy as soon as concerns have been identified which indicate that the unborn is at risk of significant harm and no later than 18 weeks into the pregnancy. It may be that concerns are not known until later on in the pregnancy at which point a referral should be made. Where identified concerns indicate risk of significant harm at any point during the pregnancy an immediate referral should be made to Children's Social Care. Early referral will enable Social Care with other agencies involved to assess the family circumstances and plan any necessary actions and support required in a timely way. This includes whether any actions are required to safeguard the child once born. The antenatal period is a vital stage in child development and in preparation for parenthood. Any other concern exists that indicate the baby may be at risk of significant harm. Professionals should familiarise themselves with their agency policies and guidance on referring to and consulting with Children's Social Care where there are concerns about a child. Most agencies will have in place safeguarding leads to whom they should discuss any emerging concerns they have about a parent or child. Professionals should utilize this resource in the first instance. Where a safeguarding lead is not available professionals should consult with or refer directly to Children's Social Care without delay. See the Referrals Procedure for advice and guidance regarding the process to follow where a professional has concerns a child is being abused or is at risk of harm. The Thresholds Document also provides important information about thresholds for safeguarding children. Children's Social Care may assess that the threshold for their services has not been met however they may signpost the referrer to other appropriate agencies /services. This may include recommending an Early Help Assessment is completed. If the referrer is of the view that the decision of Children's Social Care leaves the baby at ongoing risk of harm they must seek advice from their safeguarding lead and utilize the SWCPP Escalation Policy as appropriate. In cases where Children's Social Care accepts the referral they will carry out a Single Assessment to determine any risks to the unborn baby and consider any other needs. They will take the lead responsibility for the coordination of the case and involve other professionals as relevant to contribute toward the assessment and continue to work with the family. It is the responsibility of Children's Social Care to notify the referrer of the outcome of their referral which should normally be received within 72 hours. If this is not received within this time it is the responsibility of the referring practitioner to check the outcome with Children's Social Care. Practitioners can re-refer any case at any point if they become aware that there has been a significant change that increases the risk to the unborn baby. If there is reasonable cause to suspect an unborn baby is likely to suffer significant harm, a Strategy Discussion will be convened. This will be co-ordinated and chaired by Children's Social Care who will involve all other professionals involved with the family. For further information on Strategy Discussions and the child protection process please refer to the Child Protection Enquiries - Section 47 Act 1989. The strategy discussion will determine if there is evidence of a risk of significant harm. If this is the case then a Section 47 enquiry will be initiated either jointly with Children's Social Care and Police or Children's Social Care only to ascertain the level of and source of risk to the unborn baby and any others. It will include seeing the mother and any other significant adults as well as seeing and speaking to other children in the family as relevant to the circumstances of the case. One of the outcomes of the Section 47 enquiry is that the unborn child may not be at risk of significant harm, but may be in need of support to prevent issues worsening. In such circumstances Children's Social Care will either step the case down if it does not meet Children Social Care threshold or, work with the family and other agencies to develop a Child in Need action plan to address the identified needs and outcomes to be achieved and within what times scales. Regular child in need multi-agency meetings will be held (4-6 weekly) with the family to review progress with achieving the outcomes. These should happen on at least a 6 weekly basis. Another possible outcome of the Section 47 enquiry may be that there is evidence that the unborn baby is suffering or at risk of suffering significant harm once born. In these circumstances Children's Social Care will convene an Initial Child Protection Conference and will need to consider the most appropriate timing for this to be held. It may be that, where the pregnancy is in the early stages there is sufficient time for assessment and interventions to be provided to address the identified risks prior to birth. In such cases Children's Social Care may decide, in consultation with other agencies to undertake this work and hold a further strategy discussion at a later point in the pregnancy if necessary to consider whether the risk of significant harm is still evident. In such cases the unborn child will be subject to a child in need plan. Whether the decision following the Section 47 enquiry is to proceed to an Initial Child Protection Conference or hold a strategy discussion later in the pregnancy, the Initial Child Protection Conference must take place within 15 working days of the date of the strategy discussion where the conference decision is taken. Where Multi-Agency plans are sufficiently advanced for support to be in place prior to the birth, the initial child protection conference should take place by week 28 of pregnancy or at the latest 8-10 weeks before the due date to allow sufficient time for a plan of support to be put in place for the baby and family. (Please check your local information section for the agreed timescales for your SCB). Where there is a known likelihood of a premature birth, the Conference should be held earlier. The aim of the conference is to ensure all the information is brought together and analysed. If the Child Protection Conference decides that the child is likely to suffer significant harm once born, a child protection plan will be drawn up that focusses on outcomes to be achieved, by whom and within what timescales. The first Review Conference should be scheduled to take place within 1 month of the child's birth or within 3 months of the prebirth conference whichever is the sooner. Following an initial child protection conference, where the unborn baby is subject to child protection planning, it is the responsibility of the Social Worker with core group members and involvement of the Named Midwife for Safeguarding, at the first core group meeting to develop a detailed safeguarding birth plan and ensure that it is disseminated to agreed partners and relevant birthing units. This will detail the planning for delivery and the immediate post-natal period, including who should be notified upon the birth of the baby. The detailed safeguarding birth plan must be disseminated to relevant professionals including the Emergency Duty (Out of Hours Social Care) Service (EDS).The safeguarding birth plan should include contact numbers and names of professionals involved and the agreed arrangements for where the baby once born is to be discharged to. In the case of a planned home birth, the Ambulance Service Lead should be invited to the Birth Planning Meeting. It is the responsibility of the Named Midwife for Safeguarding Children to ensure that other health practitioners involved are informed, for example the obstetrician, neonatologist, GP, Health Visitors (HVs). The social worker is responsible for ensuring other relevant agencies such as EDS and the police are aware of the detail of the safeguarding birth plan. All professionals will need to be clear about their role and that of others, which should be set out in the safeguarding birth plan. The Safeguarding Birth Plan should be shared with parents unless to do so is felt to put the mother or baby at increased risk of harm. Professionals will need to agree how the plan will be shared with parents and who will lead this conversation. Appendix 2: Safeguarding Birth Plan and Discharge Plan Template provides a template for practitioners to record the information required for a Safeguarding Birth Plan. In some cases where a prebirth risk assessment has been coordinated by Children's Social Care with partner agencies, it may conclude that the baby would be at significant risk of harm if they were discharged home to the immediate family following birth. In these circumstances Children's Social Care will consider the best way to safeguard the baby including whether to apply to the courts for an order to remove the baby following birth. Where the plan is to apply for a court order this will be conveyed to the mother and any other person with parental responsibility by the social worker at the most appropriate time. It is however the decision of the courts whether to grant an order and there should be an alternative agreed care and management plan following discharge of the baby by all partners if this situation arises. Where Children's Social Care plan to apply for a court order at birth the Police should be invited to the discharge planning meeting in order to consider any immediate protective action required. The discharge plan will set out where the baby is to be discharged to if not to parental care. Midwives have a safeguarding responsibility to all babies and will ensure that any protective action required within the hospital setting is managed following birth of the baby. These arrangements must be included within the safeguarding birth plan, where the circumstances require, including any protective action that the Police may need to consider. Where babies are subject of a Child Protection Plan their mother should be encouraged to give birth within the hospital setting and a Discharge Planning Meeting must take place before the baby leaves. Should a home delivery be the desired choice, the prebirth Planning Meeting must clarify the roles and responsibilities of professionals at the time of birth including who should be present with the Midwife when the baby is born. Please also refer to Discharge Planning Protocol: Discharge of Children and Young People from Acute Hospital settings in Appendix 3: Discharge Planning Protocol. The discharge planning process should be initiated as soon as the mother is admitted/ presents for delivery and all Midwives caring for her should have full access to and knowledge of the Safeguarding Birth plan. The following agencies must be invited to attend discharge planning meetings (to be arranged by staff within the hospital) and should be represented in order for the meeting to proceed. The social worker will lead the discharge planning meeting where there is a child protection plan in place or the child is in need. Other agencies may need to be involved in cases and attendance should be considered such as; School Nurse, Police, Mental Health colleagues, Learning Disability colleagues, GP and any other key professionals that are in a position to support the safeguarding of the new-born. Documentation of any legal orders arising from the admission (with copies filed if available). The Social Worker will ensure that the parents and any support person they choose will be informed when and where the meeting will take place. Parents will always be invited unless to do so would present a risk of harm to the child. If this is the case the meeting will need to discuss how and when parents will be informed of the outcome of the meeting. Where a baby is born prematurely it is reasonable to plan the discharge meeting 7-10 days prior to the earliest likely discharge date. All agencies should aim to agree the baby's discharge as soon as safely and practicably possible. The newborn baby should not be discharged at weekends or on bank holidays unless there is a consensus of opinion that it is safe and reasonable to do so. This is documented in the child's medical record and discharge plan. Appendix 4: Discharge Planning Meeting Agenda provides an agenda for the discharge planning meeting. The discharge planning meeting must be fully documented and stored in the child's agency records.